The motion picture has always been useful for propaganda purposes, and in the United Kingdom especially they were handy tools for keeping morale up and spreading information that would be counter to the enemy's efforts, but once the Second World War was over, a curious thing happened: the propaganda movies continued. In fact, they continued well into the early nineteen-sixties, arguably beyond that as well, because now that the battles had been won there was the problem of what to do next that pressed on the authorities and public alike. The debts the war had run up were astronomical, and the nation was suffering from lack of resources and rationing, leaving many wondering what happened to the bright future they were promised once the Nazis were beaten. Therefore the entertainment at the local picture palace was hugely important, both as a reminder of what they were suffering for, and a morale booster for time of peace, helpful when the British Empire was crumbling. 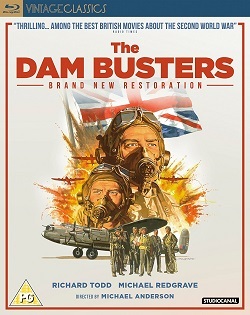 There were countless British war films produced, some higher profile than others and some with a more lasting impression too, but among the most celebrated was 1955's The Dam Busters, the tale of the mission to destroy the German dams in the Ruhr Valley as conducted in 1943. This was an operation established with incredible speed, as the scientist Barnes Wallis devised his bouncing bombs and within weeks they were deployed against the targets, the bomber crews given the shortest possible time to learn the ropes. The debate about how effective the mission was continues to this day: the Germans repaired much of the damage within months, and the leader of the British bombers Sir Arthur Harris was unconvinced it had contributed much of value to the war effort, the suspicion this was an ego trip for Wallis apparently not too far from the sceptics' minds. The film portrays him sympathetically, however, essayed by Michael Redgrave in one of his finest screen performances, though he, as a typical boffin, appears unaware of anything outside of succeeding in his inventions until the night of the raid, whereupon it all sinks in. The entire tone of the piece was one of the stereotypical stiff upper lip, but it would take a heart of stone not to have that lip tremble a little. What made The Dam Busters so effective was that it never lost sight of the humanity behind the endeavours of the war. A Hollywood movie from the same decade would have been relentlessly gung ho, and less impressive for that, but director Michael Anderson and his team opted for a quieter, more considered approach that skilfully builds from Wallis experimenting with his model missiles in the back garden to the eventual realisation of his concept as the planes make their raid on the German constructions, at great risk to the pilots' own lives. That idea of sacrifice was not one that every war movie was prepared to land so strongly, but here we were never allowed to forget that not only the crews here, but the war dead across the world, gave up their lives for peace. Richard Todd played the leader of the crews, Guy Gibson, the most decorated British flyer of World War II, with upbeat flair, coming across as a cliché to modern eyes, that is until Todd delivered the emotional scenes with understated importance. The real Gibson was apparently a colder, no-nonsense man, only twenty-four years old at the time of the Ruhr raid and would die in a crash before the war had ended, but as long as The Dam Busters plays on Sunday afternoon television in the British Isles, he will be remembered for his bravery and Todd's sympathetic portrayal of what we would like our war heroes to be, not some ultraviolent, jingoistic maniac, but someone who recognises the profundity of what they are asked to carry out, and does not relish it. The film may have been an exponent of a very identifiable genre of the fifties, the sober but informative and compassionate war movie, adhering to some degree to the facts but not afraid to emphasise the derring-do should that arise, but not everyone was agreeing with that approach. 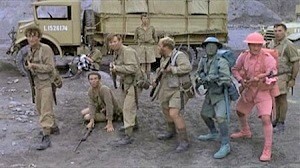 Although George Lucas appropriated the Ruhr attack as a template for his finale to Star Wars, an assuredly pro-war film with little irony, during 1957 David Lean was releasing The Bridge Over the River Kwai, which despite being held up as one of the great examples of this style was far more cynical and questioning of that sacrifice its contemporaries took for granted. That would turn out to inform the new breed of conflict on the silver screen as the sixties arrived. You could blame the popularity of Joseph Heller's 1961 novel Catch-22, which depicted World War II as an era of global insanity in humorous and tragic fashion, or more likely you could blame the crisis in Vietnam that erupted and went right out of control during that decade, but soon the younger generation who had gone to see all these flagwavers were growing cynical about the whole business of war, and Richard Lester, an American in Britain, sought to convey that in his comedy How I Won the War in 1967. Out at the same period as another scathing take on the British military class The Charge of the Light Brigade, Lester received horrified reviews that anyone should take the nobility of dying in a just war less than seriously, and the results were vilified. Naturally, it became a cult movie, and for some in '67 it struck a chord; it could be the director made the mistake in comparing the battle against fascism of over two decades before with the far more contentious and controversial Vietnam War, yet you could not say he was failing to be provocative. Throughout his career, from the sixties to his ultimate retirement in the late eighties, Lester displayed a distrust of unquestioned heroism and romanticism, therefore setting him loose on the theatre of war was bound to cause trouble. Michael Crawford, his leading man from the no less purposefully problematic The Knack …and how to use it, was our guide, taking us through the war years of his officer character who as we quickly surmise, is a complete idiot. An idiot who Britain won the war despite of, not because of, and the film indicates in its determinedly wacky style the top brass were less caring of the troops than using them as a means to and end, and expendable at that - on both sides of the combat. There were jokes all the way through this, but it wasn't especially funny, preferring to score points against its targets, which were as much the war movies like The Dam Busters, or In Which We Serve, or Dunkirk, as they were the international politics that drive countries to go to fight one another. With a cast including Beatle John Lennon, comedian Roy Kinnear and respected stage thespian Michael Hordern, this was as much offputting as it was captivating, hammering its points home unsubtly. But who said an anti-war movie had to be subtle? Looking forward to such works as Spike Milligan's bestselling semi-autobiography Adolf Hitler: My Part in His Downfall, or indeed the movie version of Heller's Catch-22, or the decidedly less profound Kelly's Heroes of the early seventies, How I Won the War summed up a certain mood among the young that these days would not be a popular choice for a war project. 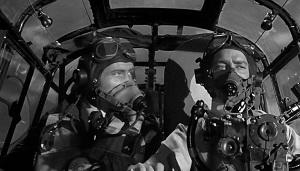 Now, The Dam Busters plays better because it takes the cost of the situation so deadly seriously, and no matter how much Lester was employing his philosophy of smuggling serious topics into his humour, his efforts merely look disrespectful. With wars still raging across the planet, we may be more likely to blame the generals, politicians and religious leaders as Lester would have preferred, but The Dam Busters offers the opportunity to claw back some respectability, some worth, from a terrible set of circumstances, Eric Coates' classic orchestral theme and all.